Nara Shika High School, is a seemingly normal school. However, unknown to the public is the cruel truth of what really goes on in the school's halls. Rather than studying, students are forced to struggle for their very survival. And the strong bonds of friendship may be the only difference between life and death. 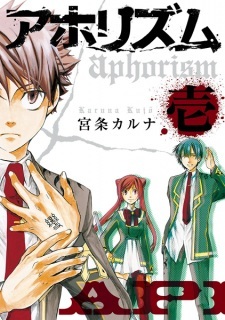 Aphorism has been published digitally in English by Yen Press since November 24, 2015. I started it after a search for a good psychological read. Aphorism doesn't have the most original premise--a school of horrors has been done before--but the way the story is carried out, the mix of characters, and overall arcs make it a well done manga. Aphorism isn't an extremely gory horror, and it has good characters and a good use of their special abilities. The main character isn't amazing, but at least he's likable. Most of the characters are. Either, it's a good read for a psychological horror. As previously stated, the story is based in a high school setting where the students must fight for survival. What we read and learn is that the high school is unknown to the majority of the public due to supernatural forces. If you can see the school floating among the clouds on an island, than you are one of the chosen ones who are accepted, otherwise you are ignorant to it's existance. Once a student is accepted into the school they are given the power to choose a special ability that will aid them in coming battles against supernatural beings. The students must fight these battles everday for a whole year before they may graduate, failure means death. The story is unique in a sense that it hasn't been done yet, but there are similarities out there. So far it has been set up nicely and I'm eager to see what shall unfold. The art is awesome. It was the cover art that caught my eye before the manga was even published. I stumbled upon Gangan Online -a Square Enix project that is an online manga reading site where the story is published -saw Momiji (main protagonist) and knew I had to read this one. So yeah the art is awesome. Well as I've previously stated I've only read a couple of chapters so it would be unfair for me to critique the character development. I can say that so far it would seem that both main protagonist are going to be doing some soul searching to discover who they are and finding inner strength to face the problems at hand. My review might contain some spoiler but I made sure it was minimal that will not affect your enjoyment while reading this manga. *a survival theme very similar to SAO, in which you don't kill each other but you need to kill some monsters..
Reading the points i mentioned above, those are the elements that made up this anime. And yes, only by looking at that, you can easily conclude that this manga isn't really that unique. But in this review I'll try to explain what makes it a VERY GOOD manga. The character art and background was average but the art of the monsters and places of ruins was really GOOD. Though I don't really care much about the art, since I always base my standards on the characters and story. This manga isn't your typical 4 or 5 man group. Since the setting of this manga is within a school, there are many characters here. And although there are many characters here, they are NOT introduced in such an overwhelming manner which will make you confused who is who. The character introduction and development was good, and to describe it specifically, the character intro/dev was done in such a way that it was inserted in between arcs or battles which gives battles/arcs an additional thrill cause it was cut halfway or before the final battle. Also the mystery given to some characters adds excitement to the story. As I mentioned earlier, its elements were not so original, but the story progression and the mysteries along with its supporting ideas were VERY GOOD and well executed. There are many battles here but its not like your typical shounen battle like --there's a certain enemy,its powerful so you need to power up then after defeating it, there comes another one which is more powerful then the cycle repeats again(just stating example, no offense). Though monsters/enemies that appears here were getting stronger and stronger as it goes on, but the method of defeating it is different. Sometimes they need to use their wits(some enemies has simple attacks but has a complicated way of defeating),sometimes just pure ability/strength, sometimes they need to have team work(no matter how powerful you are you can't beat it without the help/participation of your teammates) and etc etc.So that makes every battle here very exciting and unique from each other. And also the enemies has their supporting background like for example a guardian from river stix(this doesn't exist on the story, just an example to avoid spoiler). Another thing is the enemy/goal. There is a clear goal here, though there are a lot of mysteries and enemies here, after some chapters a main enemy who caused all the chaos will be introduced which sets a main goal here. (But i hope that defeating that last boss will end this manga since many stories got ruined by trying to drag it longer). Another factor that makes this very good is its Wittiness. By wittiness i don't mean it like mind battles like a game of chess. The wittiness that I'm pointing here are the following --The application of kanji (chinese characters) to make/have their own unique powers/abilities, The supporting sub stories for enemies, the complicated events and solutions for every **blight/trials, and the puzzling places. Everything is not that simple but not too complicated to make the readers confused. **blight/trials - a phenomenon that triggers appearance of monsters or warps the students towards a certain place. As a summary, at first it was full of mysteries and cool characters/powers(the best part of the manga so far), then of course at some point you'll feel some events were kinda repeating and has some redundant conversations but then there's again another mystery/sub story that will hold your interest(this manga will not let you feel bored) and so far the latest arc is exciting. So overall it was 8(VERY GOOD). And if you're skeptic about this manga I think you need to read at least 5 or more chapters before deciding if you'll drop this or not.